Do you need a makeover or a massage to decompress? 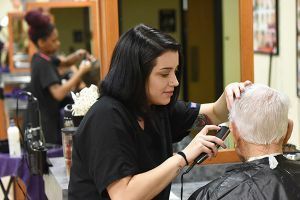 Well, The Salon at Pensacola State College is taking appointments to cure what ails you – be it gray roots or a knot in the neck. To schedule a hair, nail or massage appointment, call (850) 484-2567. Located in Building 12 on the Pensacola campus, services are available to faculty, staff, students, and the community. Nail appointments for manicures, pedicures and gel polish are available at 9:15 a.m. and 11 a.m. Tuesday-Wednesday. Manicures are $8, pedicures $21, and gel polish $11. Enhancement services such as acrylic nails will be available later in the semester. Massages are available at 2:25 p.m. and 3:40 p.m. on Wednesday and Thursday. A table massage is $26, while a chair massage is $12. Clients will need to arrive 10 minutes early to complete the necessary paperwork. Barber clients can walk-in and receive services from 5:30-7:30 p.m. Monday-Wednesday. No appointment is necessary. Clipper cuts are $4 or clipper cut with beard trim is $5. Hair appointments are available 8:15-10:30 a.m. and 12:15-2 p.m. on Tuesday and Wednesday. Appointments also are available 8:15-10:30 a.m. Friday. Chemical appointments such as coloring, perms, or relaxers can only be scheduled for 8:15 a.m. or 12:15 p.m. Morning hair-cutting appointments start at 9. Afternoon haircutting appointments are at 1 p.m. or 2 p.m.
Chemical service prices range from $20 to $50. A shampoo/cut/style starts at $12. All services are subject to an up charge depending on hair length, thickness, and amount of product used. Hair appointments only are also available on the Milton campus, and the schedule and prices are the same as at the Pensacola campus. Call (850) 484-1397 for an appointment. The salon is located in Building 4300. The facial program will start taking clients on March 7 at 9:30 a.m. or 10:45 a.m. or 6:15 p.m. or 7:45 p.m. These services are available at the Pensacola campus only. An advanced facial is $29, and microdermabrasion treatment is $34. Appointments are being taken now for these services.